The Elementary Developmental Learning Program provides a comprehensive program for elementary students with multiple physical, intellectual, neurological, and communication impairments. 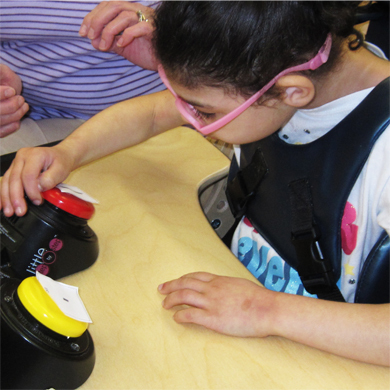 Emphasis is placed upon sensory-based learning, movement, total communication, and adaptive technology. Therapist’s activities are integrated into students’ daily classroom routines. The program incorporates assistive technology, multi-sensory instruction designed to foster participation, awareness, and self-determination. Environmental structure and positive behavioral supports are individualized for students to assist in processing and communicating information. Students require structured teaching of social protocol. Academics are individualized and focus on maximizing students’ strengths. RELATED SERVICES: Students may have daily medical needs that require care by a classroom nurse. Direct speech therapy, occupational therapy, and physical therapy are provided per each student's IEP. Therapists also provide staff consultation in order to embed therapeutic techniques into the daily classroom routine. Vision services are also available as needed.